Dessert! 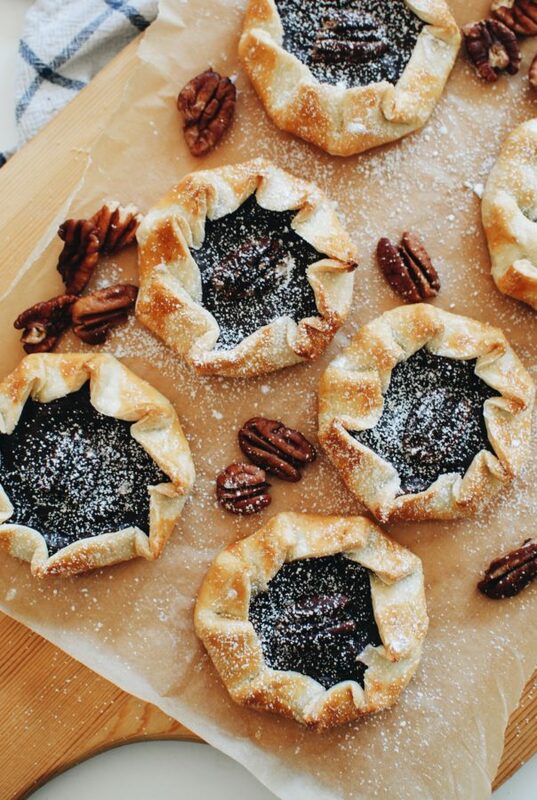 We seriously, desperately need dessert. 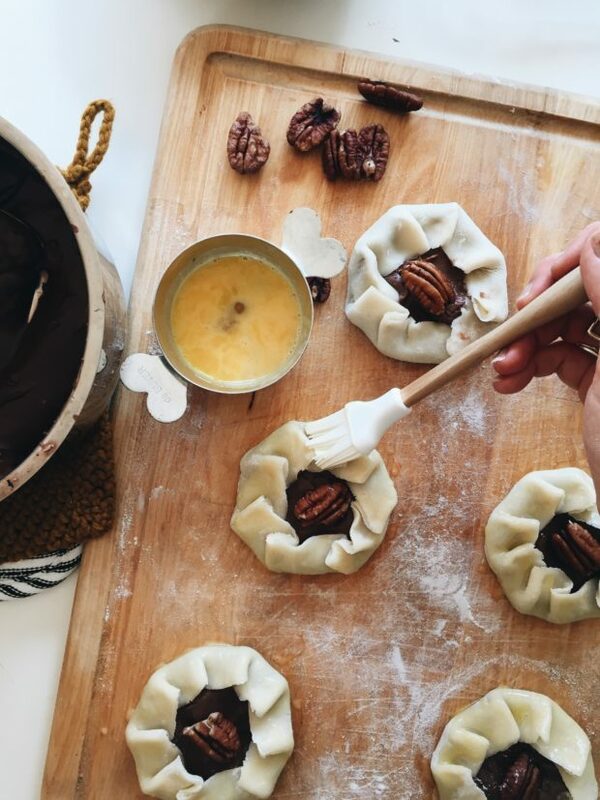 And not only is it a dessert, it’s more like a Thanksgiving/Holiday/Life HACK. 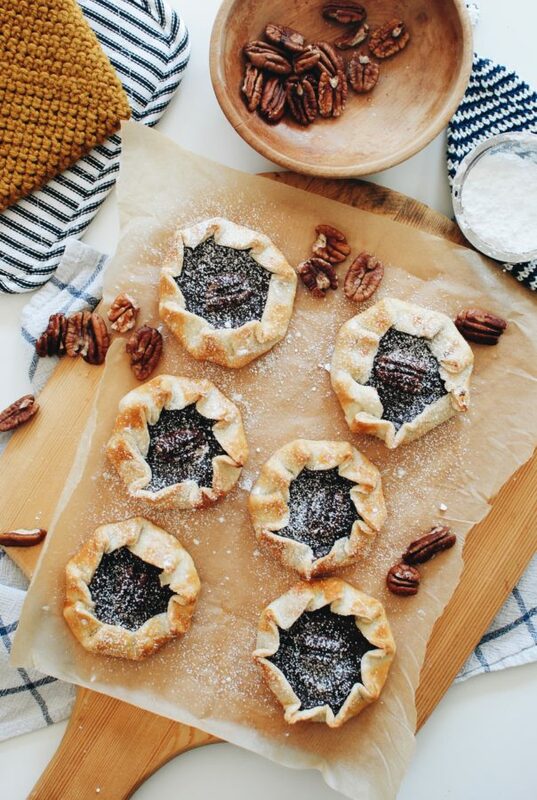 Because you guys, it’s chocolate pudding in those galettes. As in, those clever little boxes of chocolate pudding. Open, mix, heat up, stir, done. Also, cream cheese. There’s cream cheese in the pudding. Which is inside the galettes. The cream cheese and the pudding. They’re both in it. Just in case you forgot. While we’re in Hackville, just buy one of those roll-out refrigerated pie crusts and use a 5-inch bowl to cut out little circles. 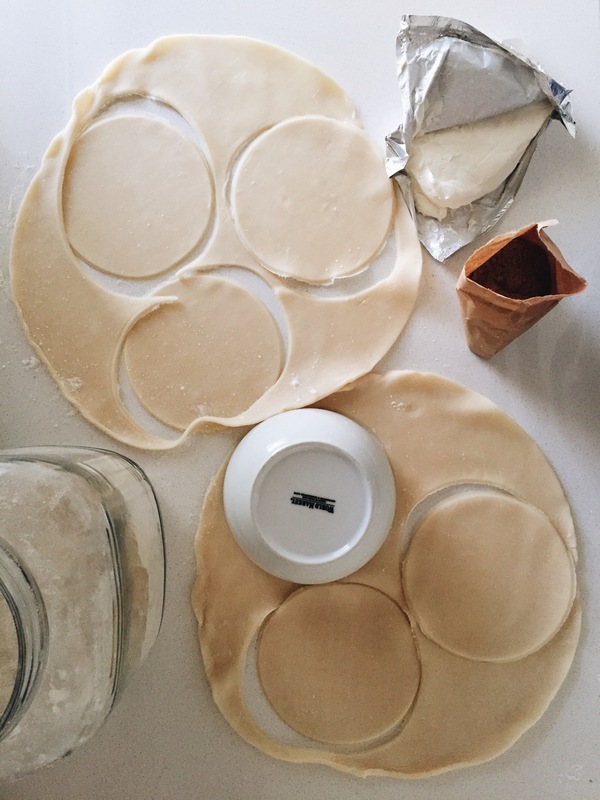 It made six circles for me, so you could moooost def squish and roll up the remaining dough and re-roll it out, but I have the patience of a cracked-out hummingbird, so. The pudding! Okay, get the kind that says “cook and serve.” BECAUSE of the cream cheese. At first when you put the cream cheese in there it will be lumpy and weird and chicken poxy and you’ll be cursing my name. But as soon as the pudding warms, everything gels together like David Copperfield in a pot and you’ll be praising my name. Another thing to note:: I only used one cup of milk (half of what the box calls for) because I was afraid the puddin’ wouldn’t hold up inside the galettes. I needed a gutsy pudding! Let’s start a band called Gutsy Pudding. We’re already awful. Then you’ll take the edges of the pie crusts and just overlap, overlap, overlap. You’ll get the feel for it. Just put on some sweet tunes and get your fold on, already. 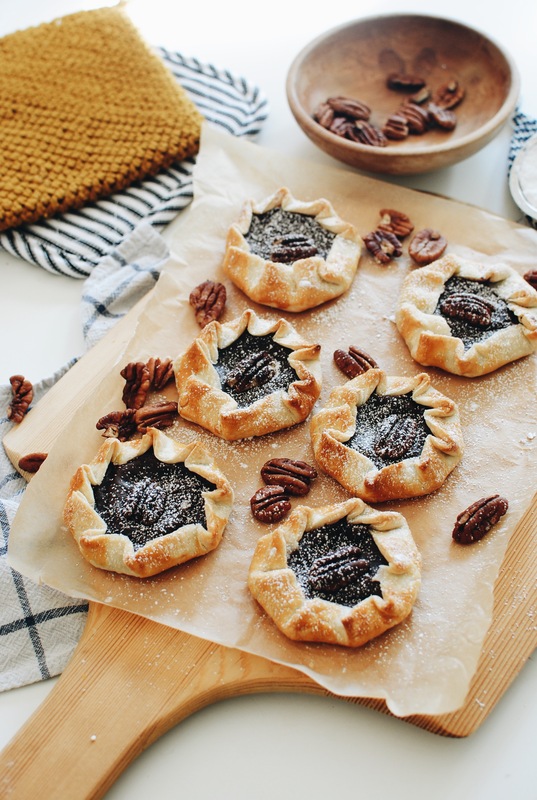 Place a single pecan in the middle of each baby galette. Bam. Brush with an egg wash. Boom. Get ’em ovenized. Do what? OH HIIIIIEEEE, mini poppable chocolate dessert o’ glory. Nice to meet slash eat you. You’ve dusted them with a sprankle of powdered sugar, by the way. That’s why you’re sobbing uncontrollably right now. Make these! You must. You just must. Your kids will F L I P out. Your Friendsgiving platter beggeth. Your Saturday afternoon can’t live without them. Your face will pretty much punch itself. Stupid simple, perfect chocolate flavor with a hint of tart (cream cheese! ), all wrapped in a pie crust. In a small pot, add the pudding mix, milk and softened cream cheese. Heat the pudding and continually whisk until the pudding has gelled and thickened. Only takes a few minutes. Take off the heat and let slightly cool. 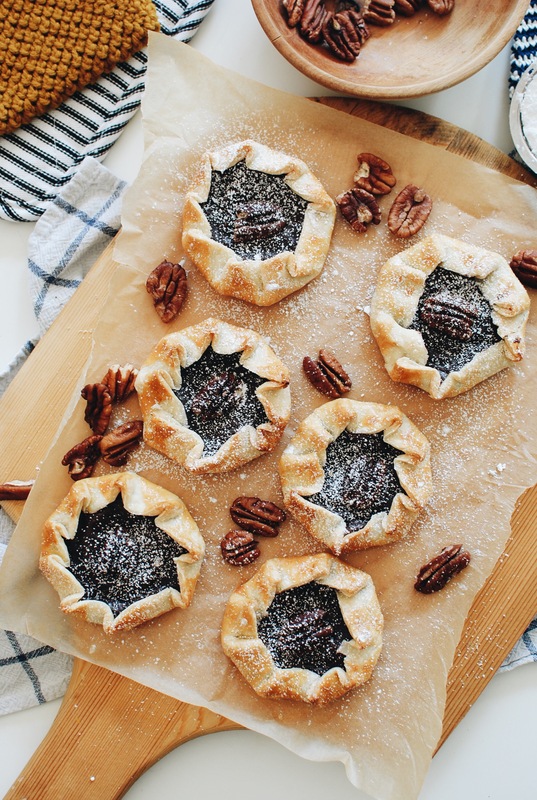 Roll out the pie crusts, and cut into six 5-inch circles (a bowl works great!). Spoon a couple of Tablespoons of pudding into the center of each pie circle, and sort of spread it out. 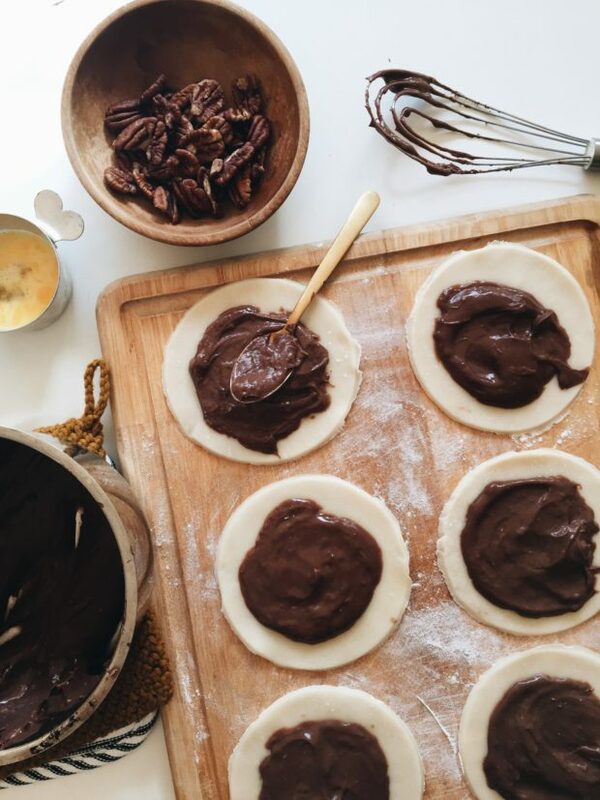 Then fold the edges of the pie on itself, forming mini galettes. 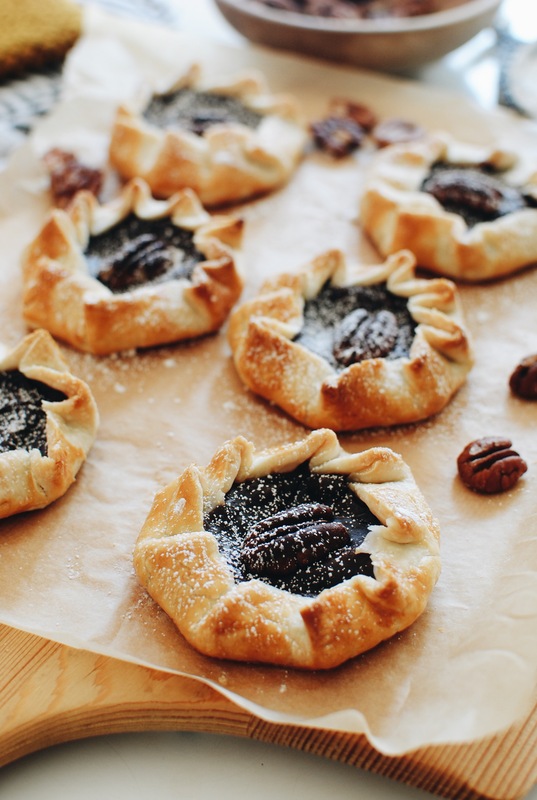 Brush each crust with the egg wash, and place a single pecan in the center of each galette. Bake for about 25 minutes, or until the crust edges are golden brown. Dust with powdered sugar, open your mouth and throw every single one in. And by some I mean all. These are totally calling my name, with a hint of Nutella! OMG. Is that a 8 oz. cream cheese , or a 4 oz. ? Love your site. Oh! Half of an 8oz block of cream cheese. Thanks for the heads up!